Sandoval County is a county located in the U.S. state of New Mexico. As of the 2010 census, the population was 131,561, making it the fourth-most populous county in New Mexico. The county seat is Bernalillo. Sandoval County is part of the Albuquerque, NM Metropolitan Statistical Area. 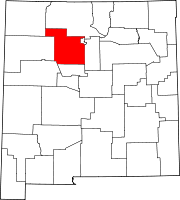 Sandoval County was created in 1903 from the northern part of Bernalillo County. Its name comes from one of the large land-holding Spanish families in the area. The original county seat was Corrales, but it was moved to Bernalillo in 1905. Mormon Battalion Monument (New Mexico) is in the county. According to the U.S. Census Bureau, the county has a total area of 3,716 square miles (9,620 km2), of which 3,711 square miles (9,610 km2) is land and 5.3 square miles (14 km2) (0.1%) is water. The highest point in the county is the summit of Redondo Peak, at 11,254 feet (3,430 m). A relatively small portion of the county exists as a geographically separate exclave between Los Alamos County and Santa Fe County. This came about when Los Alamos County was created; the land that became the exclave would have been part of Los Alamos but was excluded owing to its sacred status among the local Indians. Rather than be ceded to neighboring Santa Fe (or Los Alamos) it has remained part of Sandoval. Sandoval County has 12 Indian reservations and two joint-use areas lying within its borders. This is the second highest number of reservations of any county in the United States (after San Diego County, California, which has 18 reservations.) Riverside County, California also has 12 reservations, but no joint-use areas. As of the 2000 census, there were 89,908 people, 31,411 households, and 23,621 families residing in the county. The population density was 24 people per square mile (9/km²). There were 34,866 housing units at an average density of 9 per square mile (4/km²). The racial makeup of the county was 65.08% White, 16.28% Native American, 1.71% Black or African American, 0.99% Asian, 0.11% Pacific Islander, 12.37% from other races, and 3.47% from two or more races. 29.40% of the population were Hispanic or Latino of any race. There were 31,411 households out of which 38.60% had children under the age of 18 living with them, 57.70% were married couples living together, 12.20% had a female householder with no husband present, and 24.80% were non-families. 19.90% of all households were made up of individuals and 6.90% had someone living alone who was 65 years of age or older. The average household size was 2.84 and the average family size was 3.29. In the county, the population was spread out with 29.60% under the age of 18, 7.50% from 18 to 24, 30.10% from 25 to 44, 22.20% from 45 to 64, and 10.60% who were 65 years of age or older. The median age was 35 years. For every 100 females there were 95.20 males. For every 100 females age 18 and over, there were 91.70 males. The median income for a household in the county was $44,949, and the median income for a family was $48,984. Males had a median income of $36,791 versus $26,565 for females. The per capita income for the county was $19,174. About 9.00% of families and 12.10% of the population were below the poverty line, including 15.60% of those under age 18 and 9.20% of those age 65 or over. As of the 2010 census, there were 131,561 people, 47,602 households, and 34,548 families residing in the county. The population density was 35.5 inhabitants per square mile (13.7/km2). There were 52,287 housing units at an average density of 14.1 per square mile (5.4/km2). The racial makeup of the county was 68.0% white, 12.9% American Indian, 2.1% black or African American, 1.5% Asian, 0.1% Pacific islander, 11.5% from other races, and 3.9% from two or more races. Those of Hispanic or Latino origin made up 35.1% of the population. In terms of ancestry, 13.2% were German, 9.3% were Irish, 8.7% were English, and 3.3% were American. Of the 47,602 households, 37.6% had children under the age of 18 living with them, 53.9% were married couples living together, 12.5% had a female householder with no husband present, 27.4% were non-families, and 22.0% of all households were made up of individuals. The average household size was 2.75 and the average family size was 3.22. The median age was 37.9 years. The median income for a household in the county was $57,158 and the median income for a family was $65,906. Males had a median income of $48,967 versus $35,101 for females. The per capita income for the county was $25,979. About 8.3% of families and 11.4% of the population were below the poverty line, including 14.0% of those under age 18 and 10.8% of those age 65 or over. ^ "Bernalillo is now the county seat". Santa Fe New Mexican. May 8, 1905. p. 8. Retrieved April 28, 2017 – via Library of Congress. ^ Leip, David. "Dave Leip's Atlas of U.S. Presidential Elections". uselectionatlas.org. Retrieved April 2, 2018. This page was last edited on 15 April 2019, at 02:28 (UTC).